The name “bluroc” will be familiar to any collector who hunts glass regularly on eBay, not only because he has an uncanny knack for finding the most desirable glasses even before many of us have had time to take the first sip of coffee in the morning, but also because he usually ends up winning them despite fierce competition. The man behind the bidder id is Kevin Wade, one of the online community’s old timers. Kevin’s eye for the rare is coupled with a laudable -- some would say impossible -- restraint. He limits himself to the pristine, seldom bidding on a glass with so much as a nick in the rim, let alone anything with a thin or worn label. I later discovered that he also prunes his collection mercilessly on a regular basis, discarding anything he considers mundane or tainted. The result of this constant winnowing is a collection that is relatively small (a hundred or so glasses) but that is equaled by few others in the country in terms of quality. It includes an impressive number of glasses with highly-prized colored labels, many of which can be seen in the final page of this article. Kevin does not limit his collection to shot glasses. 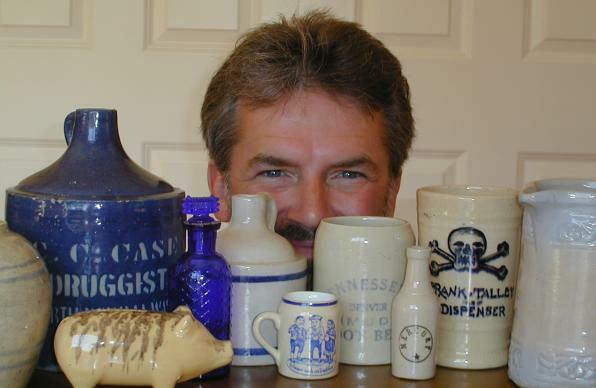 Click on a link to his eBay bidding history and you’ll find jugs, mirrors, flasks, photographs, signs, cigar boxes; anything and everything old. It didn’t take me long to recognize that this was someone to keep an eye on and get to know. Kevin was one of the first collectors who graciously agreed to be interviewed by Howard Currier for Random Shots. In preparing for this feature, Kevin took it upon himself to photodocument his entire collection. As you can see from this and the following pages, the results of his efforts are nothing short of breathtaking. The text that accompanies the images was provided by Kevin in response to a list of questions compiled by Howard and myself some time ago. Here, in his own words (and images), is the story of the Kevin Wade collection.